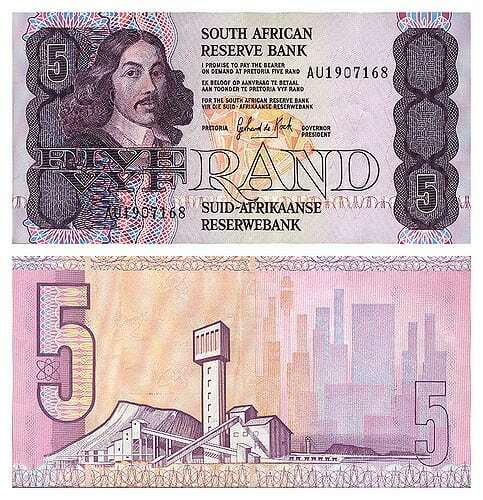 Jan van Riebeeck was not a very nice fellow. At best, the letters and journal he wrote detailing his decade as first commander of the Cape of Good Hope (1652-1662) show that he was an ingratiating little toady, constantly trying to find favour with his bosses (the Dutch East India Company or VOC) in the hope of securing a more prestigious posting in the East. Unpopular even among the rough-and-ready soldiers of fortune who joined him at the Cape to set up a refreshment station (and who absconded or at least requested transfers in astonishing numbers), not to mention the indigenous Khoi people who soon found themselves cut off from their traditional grazing lands and water sources, Van Riebeeck did not deserve the adulation he received in pre-democratic South Africa. Not JvR but Bartholomeus Vermuyden. So much of what we were taught about him under Apartheid simply wasn’t true. It wasn’t even his face gracing our old paper currency! (The chiselled features and flowing locks seem to have belonged to a certain Bartholomeus Vermuyden, who never set foot on African soil…). But one thing’s for sure: it was Jan van Riebeeck rather than Simon van der Stel (of Stellenbosch and Constantia fame) or the vastly over-hyped French Huguenots (of Franschhoek) who sowed the seeds of the South African wine industry. Even before his appointment as commander, he was pushing for vines to be planted here. ‘Wine acts as a cordial, and strengthens,’ wrote the then junior surgeon in what was effectively his June 1651 job application. On 13 May 1652, little over a month after arriving here, he wrote to his VOC directors requesting that he be sent cuttings of vines ‘that will grow against the mountains as beautifully as in Spain or France’. The first recorded arrival of viable vine cuttings occurred on 22 July 1655, when the Leeuwin docked with a single tray of ‘wyngaerd’. It was followed by the Dordrecht with a tray of French vine cuttings and the Parel with three vats (‘tobbekens’) of cuttings. Total yield was a ‘cleyn proeffieu’ of only 12 bottles, but Van Riebeeck had far greater ambitions. He had repeatedly tried to press vine cuttings on the first vrijburghers – men granted land along the Liesbeeck River from 1657 onwards – but found them to be ‘very indifferent’. So in August 1658, ‘during the waning moon’, he planted 1200 cuttings on the land he’d personally been given permission to farm – then known as the Bosch Heuvel or Bosheuvel, today the prestigious suburb of Bishopscourt. However, all he got in return was criticism for providing insufficient refreshment to visiting ships (based on complaints that he insisted were untrue) and a command to start preparing for his dismissal from the Cape. Vastly over-hyped French Huguenots – what contribution did the gibsons have to the wine industry ? Except your academic achievement of level 4 !!!! As a French Huguenot descendant myself, I don’t see anywhere that she’s insinuating that the Gibsons had some sort of contribution, of whatever magnitude. She’s merely commenting on the weighted influence, in establishing our wine industry, of the Huguenots vs Van Riebeeck vs Van de Stel. Fascinating piece. Great piece – thanks, Joanne; I wish there was more interest in finding out about the details of the history of Cape winemaking. As to the Huguenots, and du Toit’s point (if it is one): Despite the assumptions made in most lazy, unresearched histories of Cape wine, it’s very difficult finding any real evidence that the Huguenots made a contribution to wine production here (beyond the increased number of farmers, of course). If anyone has anything approaching disproof of this, I’d be grateful to see it and have the opportunity to recant. There seem to be no contemporary accounts of any Frenchman being praised for adding to Cape viticulture or viniculture. And it goes wider than wine – while, for example, the Malay slaves had a lasting effect on culture in the Cape (certainly food), there seems to be no culinary or other cultural tradition going back to the Huguenots. Of course, they did strengthen the white, Protestant presence, as they were seamlessly and quickly absorbed into the Dutch-Germanic culture. Even use of the French language seems to have died out within a generation. Happily we’re left with all those lovely French farm names (the farms generally well known for their Cape-Dutch architecture! ), not to mention the names of many farmowners. I also take offensive and I hope this post will be removed. and Joanne is not the only contributor that has made these kind of derogatory remarks toward a certain population group. Du toitskloof gave her 30grand , im also an over hyped huguenot , will definitely not buy my muscadel or sauvignon from du toitskloof again. Shame on them du toit is also huguenot . I’m sorry Hennie and du toit have taken offence. Regarding Jan van Riebeeck, it seems impossible to talk about him without stirring up emotions, one way or the other, but there’s simply no way he can still be celebrated as a heroic figure who almost single-handedly brought civilisation to the southern tip of the dark continent. He most certainly DID succeed in providing refreshment for passing VOC ships, to the extent that the Cape soon ceased to be merely a refreshment station but a place that the VOC saw value in settling permanently (albeit only from 1657 onwards), and I must say that his early enthusiasm for the ‘loveliest and most beautiful’ Cape and for winegrowing in particular (despite not knowing the first thing about it) really touched me. I imagine that he probably ended up a fairly sad and disillusioned ‘Company Man’ who might have been much happier if he’d applied to become a vrijburgher himself, stayed at the Cape, and made wine with advice from a couple of ‘vine fanciers’ that the VOC did send eventually out (Pieter Adriaan van Aarnhem in 1664, for example; Hans Adam Cockenberger of Vienna in 1676). It seems the De Villiers brothers and Taillefert in turn gave Van der Stel a helping hand, instructing their peers on things like ‘neatness’, only harvesting grapes when ripe and not using dirty barrels (or face Van der Stel’s harsh penalties…). My point, I suppose, is that our early wine history is absolutely fascinating, and if we’re going to keep trotting out clichés such as ‘straddling Old World and New World’ then we should have the evidence to back it all up. THE EVIDENCE IS THERE AND WHAT’S MORE IT GOES BACK EARLIER THAN IS TYPICALLY TALKED ABOUT. As early as 1666, wine samples sent to Europe were deemed ‘contrary to expectation, very well tasted’ and by 1670 the Cape even had a leading winemaker, officially recognised. This was TEN YEARS before Simon van der Stel arrived, TWENTY years before the De Villiers brothers! For what it’s worth, I’m hoping to uncover – and share – more of this early history, and I promise I’ll try to do it sensitively. and please do tell us about the English, Im sure they also did something good for the industry..
And here I thought, what a lovely little piece of history laid out. After 7 generations in SA, I don’t think any of my farming family members would take any offence to any of the well researched statements Joanne made here. It had to start somewhere and all I read into this was that it was indeed not the Huguenots who “sowed the seeds” of our industry. Jan, love or hate the man, I certainly have no illusion about his distance from sainthood, did order the first plantings of vines. That’s all! I sense there might be a follow up article by Joanne taking this history decade by decade till we get to the Huguenot part and their contributions. Come on guys, this is simply history on paper, not politics. Thank you Joanne, I enjoyed the piece. I hope – the vastly over-hyped French Huguenots – that still produce great wines in south africa 330 years later take note of this wine journo. Hopefully Franschhoek recalls its award to her. Fascinating read. Would be very interested in hearing more about how the wine scene developed in Cape post Van Riebeeck. Loved this – a fascinating history piece. The old Cape is a fascinating place, and I hope there’s more articles like this to come Joanne! I fail to see what there is to take offense about. It’s facts and history, not politics. O my Joanne! Loved the commentary, this history is so fascinating, and the story gives context to our place in the world of wine. What I found interesting in my research was the early arrivals of vine stock came from Holland, Brazil, St Helena, India, Italy, Spain and the mind blow, Japan. Judging by some of the comments here where people took ‘offence’ at the hugely informative article, Wine Mag should institute a Comprehension and IQ test on its landing page to make sure that prospective readers are competent and intelligent enough to continue reading the rest of the website. Johan, interesting to note that you are advocating a comprehension and IQ test to ensure that readers are competent and intelligent. I’m not sure what is your basis for such statement other than total ignorance and stupidity. That places you squarely in the incompetent and unintelligent category which will prevent you from reading the rest of the website. Seems you are just a narcissist. Jonathan, being a self-appointed judge regarding supremacy ostensibly on the basis of your comprehension and intelligence smacks of irony in the extreme, doesn’t it? A very slippery slope you are traversing, be careful. Thanks Le Penseur. But I’ll have to dismiss your comment as totally irrelevant because you’re too spineless to use your actual name. Another Afrikaner taking offense? why anonymously? Or is it Mr Rodin’s ghost? Like Hennie T (sort of), I would love to see a follow up on the effect of British rule on the SA wine industry, resulting trade implications, the Cobden-Chevalier treaty and so on. The good, the bad. Would make for another great read. There must be good reason the Brits spend ZAR 1bn + worth of numerical good year on year on SA wine, and import a tenth of total SA production. Briefly, my impression is that Cobden-Chevalier was pretty devastating for SA exports, and it more or less coincided with the arrival of powdery mildew (1859) and then phylloxera (1866). A triple whammy. And yet the industry slowly but surely recovered! Perhaps that’s what fascinates me most : that time and time again, over the centuries, SA producers have overcome seemingly insurmountable odds. I think that there’s a lot in our history that can inspire us going forward. Hi Joanne. Do you have any material or recommended reading on the impact of the Anglo-French war and Cobden-Chevalier agreement on the South African wine industry? I’m sure French-British antagonism made life interesting for their respective viticultural interests in the Colony. Very briefly, my understanding is that around the time of British occupation (1795 onwards), most local inhabitants sympathised with the Dutch/Batavian Republic (aligned with Napoleon) and needed a lot of “appeasing”. Certainly Hendrik Cloete Jnr of Groot Constantia was described as “morose, uncouth, and churlish in his manners” towards most British visitors (and especially towards His Majesty’s representatives, who demanded wine for the same discounted rate that had been imposed by the VOC) whereas the welcome he extended to French visitors (e.g French painter Jacques-Gérard Milbert) was exceptionally warm. Speaking of Constantia specifically, I think that Britain’s termination of preferential import duties for Cape wines in 1860, followed a year later by Cobden-Chevalier, sounded the death knell for the legendary sweet wine (produced by Groot Constantia alongside the largely forgotten but equally important Hoop op Constantia). Contrary to countless claims, production did NOT cease because of phylloxera. Phylloxera only hit the Constantia vineyards relatively late – on 26 Nov 1898, to be precise – decades after the owners of both Hoop and Groot had been declared bankrupt. Afrikaner, no, Scot in fact, thank you. My comment does not relate to any nationality whatsoever, seemingly something you either simply muffed or does not comprehend. Notwithstanding, look as if you dismiss Afrikaners as people of low intelligence, don’t you? The comment, further, does not have any relation to any “offence” either, just your simple irrational comment relating to intelligence without any factual basis. You simply dismiss my response as irrelevant purely because you do not have a proper thoughtful and factual basis for your irresponsible and belittling comments concerning people’s intelligence, perhaps, just perhaps exposing your own? Inference must be carefully distinguished from conjecture or speculation. There can be no inference unless there are objective facts from which to infer the other facts which it is sought to establish …. But if there are no positive proved facts from which the inference can be made, the method of inference fails and what is left is mere speculation or conjecture. Jonathan, at least you are thinking, but this is no comedy and hopefully it will not open the “Gates of Hell”. I am no poet but maybe Dante can provide some distraction and amusement to this saga. Thanks Joanne for the insight, great piece. Finally some debunking of the Huguenot myth in terms SA wine history. These were religious refugees fleeing horrendous persecution, but were followers of the very rigid Calvinist doctrine and unlikely to have approved in life’s pleasures. Just some realism and besides, Franschhoek is not exactly Quebec. Re the culinary contribution of the Huguenots, I think we could accept the validity of research done by eminent culinary historians like Renata Coetzee (the bibliography at the back of her early work The South African Culinary Tradition (Struik 1977) runs to a full A4 page) and accept that their contribution, homely rather than gourmet, include a raft of domestic improvements: draining fat from food, flavouring with fresh herbs, replacing stolid Dutch hotpots with fricassees. They also introduced the practice of serving dishes in sequence – soup followed by main course, followed by dessert – rather than plonking everything on the table simultaneously. Raisins and apricots preserved in brandy are a well-known Cape Huguenot conserve while popular crisp and light obliejties (oublies in France) were among Hildagonda Duckitt’s favourites. Etc. The Huguenots brought their food culture without wine – I doubt that. One has to be blind not to see the Huguenots contribution to the wine industry. It’s tangible and there to see for everyone. I don’t see any “Huguenot myth” only massive achievement. What exactly is there for everyone to see, Hennie, seriously? French estate names? Traditional middle class South African home cooking is more British than anything else with smatterings of Malay and wine-wise why are we the rest of the new world? Distilling brandy is really the only evidence i see. Dieter not a French culture but the development you see. There was nothing of this before they came. No one is trying to be French. Hennie, it certainly makes for a good marketing spiel in the wine business, but when you consider SA’s reputation pre-19th centuary rested on Constantia and not much else, I’m really not convinced the Huguenots were more influential than Dutch or German settlers. But I’m happy to see evidence to the contraray. You make sweeping statements but haven’t listed one tangible fact. Please be specific and enlighten us with facts. Sorry, mistake “pre-19th centuary” should be “pre-20th century”. Mr Martin, can you give us facts to the contrary? In my next post, I will share the facts that I have discovered from the 1660s, and then I will move on to the 1670s, followed by the 1680s, which of course ended with the arrival of the Huguenots. It will be an exciting voyage of discovery for all, I hope.